You sense and noticed you are being watched or followed everywhere you go. You noticed frequent “wrong number” call from your home, work or anywhere via land line or mobile phones. You noticed consistently rude behavior from people you don’t know for no apparent reason. You noticed increased in stressful work loads. You have problems at work where you feel, a groups of people are plotting to have you terminated. Your business deals consistently falls through for no apparent reason. You noticed that your things are not in the same place you left them on when you left home or some small items may be missing and notice to re-appear after a few days or weeks. You experience frequent car repairs even after your car has been fix. You experience frequent appliance, electronic malfunctions e.g. computer being crash, computer access activities being manipulated. You noticed frequent noise like people slamming car doors and car horns when you’re around, noticeable helicopter flying over. You noticed someone talking on his or her cell phone loudly like asking for your attention and talking about something familiar to you while you’re around. You noticed increase in negativity in the way you think and frequent mistakes in decision through out the years. You noticed increase in people thinking of you as “paranoid” or “delusional” and/or has mental disorder. Things you can do – First, keep a mantra in your head and heart: “Get rid of all the “NEGATIVITY” and always think you are not “CRAZY” as what many think of you! Second, stalking is a crime. Making someone’s life miserable and harming someone premiditatedly is a crime. There are things you can do to fight back… Document everything! This will do two things. It will make the stalkers more careful and aware that you know what he or she is doing and maybe make your life easier and their job harder/irrelevant. And it will provide a record in the event of legal action. Get a camera if you don’t have one and start taking pictures or video. Mention it to someone. Write a blog about it. Seek support from unconventional route. Do research about all aspects of OSEH (organized stalking and electronic harassments), example: legislations, health issues, activism, advocacy, victims. Urban Dictionary: Organized Stalking – A system of organized psychological terror tactics used against a person who has become an enemy of an individual or a government. 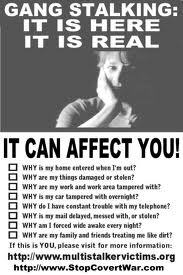 Subtle but effective techniques of stalking by multiple individuals and psychological intimidation and manipulation are used to slowly but surely drive the target to make complaints to authorities who will see the complaints as bogus because of the methods used against the target. 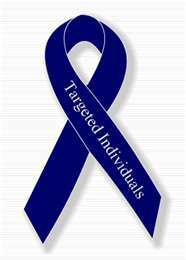 As a result, the target gets labelled as mentally ill. 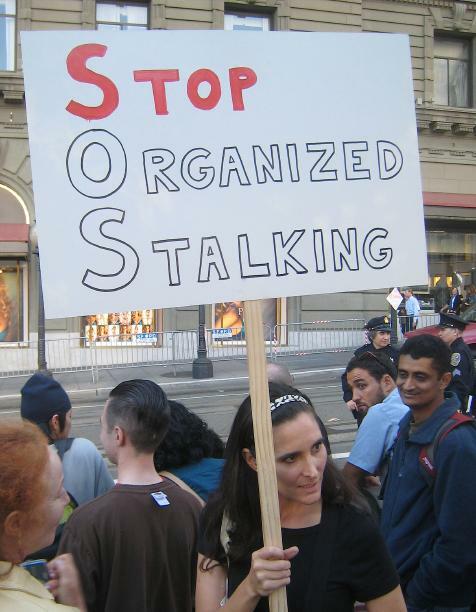 There are as many stalking tactics as there are targets as the multistalkers will tailor the stalking to the individuals habits and individual personality. Some common examples or organized stalking are: following the target on foot, by car and public transportation, crowding the target’s space in a public place, murmuring insults under the breath so only the target can hear, sitting in the car outside the target’s residence, starting “fights” in public with the target, doing “skits” on the street which involves information only the target should know but has been found out via surveillance of the target, stealing and vandalism of the target’s possessions. You can probably tell you are being stalk, when the stalker tells you that it’s stalked, not stalk.